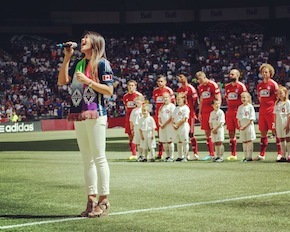 Marie Hui is currently the Vancouver Whitecaps FC’s Official Anthem Singer, and has been since their inauguration into the MLS (2011-present). She has also performed the anthems for the Vancouver Canucks, Vancouver Canadians, UBC Thunderbird, and many other public and private sports events around Greater Vancouver. She is also regularly contracted to sing the anthems at corporate conferences and marathon events around town. Most recently, she performed in front of 67,000 people at a Seattle Seahawks NFL game, singing both the Canadian and American anthems during their yearly "Canada Day" game on September 21, 2014. She was invited to perform at CenturyLink Field a second time on October 10, 2014 by the Seattle Sounders, representing their rival team, the Vancouver WhitecapsFC. 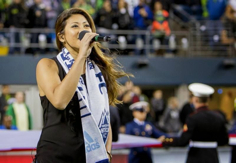 Marie Hui is available for hire for National anthem appearances. She is able to sing the Canadian anthem in English and bilingually, in addition to the American anthem.